John Vautier of the 88th Pennsylvania wrote a regimental history of his regiment, History of the 88th Pennsylvania Volunteers in the War for the Union, 1861-1865, which was published in 1894. The book contains several good descriptions of battles, including the following. In this excerpt, author John Vautier takes a look at the experiences of the 88th Pennsylvania on Gouverneur Warren’s Stony Creek Raid, December 7-14, 1864. The 88th Pennsylvania, like most of the rest of the Fifth Corps, braved the elements and the just as hazardous Confederate cavalry to march south to Belfield, Virginia on the Meherrin River. The object was to burn the Weldon Railroad from that point north to Stony Creek. Doing so would force the Confederates to haul supplies on an even more roundabout route to Petersburg. In this they were successful, making a creaking and wheezing Confederate supply situation even worse. 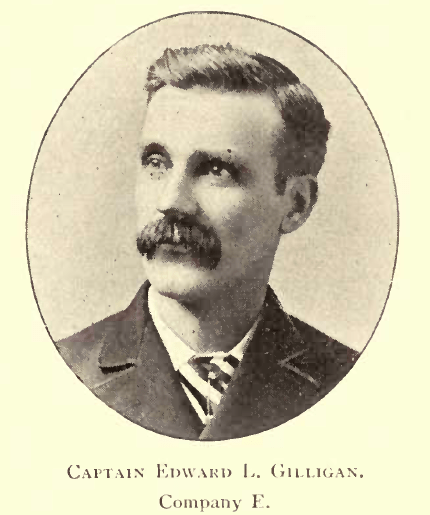 The majority of this excerpt focuses on Adjutant, and eventual Medal of Honor winner, Edward L. Gilligan. Gilligan had had enough of the Union cavalry running away from their Confederate counterparts and discomfiting the 88th Pennsylvania and other Union infantry serving as the rear guard of Warrens column. He decided to do something about it, and found himself surrounded by Confederate troopers! It’s surprising Gilligan didn’t win a second Medal of Honor for his actions described below. On December 7  the division marched down to the North Carolina border, on what is known as the apple-jack raid, each man having six days rations of food and unlimited rations of rain and mud, for it stormed almost every day while on the raid. The Johnnies were scattered and the [Weldon] railroad thoroughly destroyed as far as the Mulherrin [sic, Meherrin] River; then the mud-bespattered column halted and, meeting strong opposition, concluded to return. While coming back a force of cavalry acted as rear-guard, the 88th [Pennsylvania] and 11th Pennsylvania, 97th New York, and 39th Massachusetts being thrown out as flankers. Presently the Confederate troopers following the column made a furious and unexpected charge upon the Union horsemen bringing up the rear, driving them in confusion up the road towards brigade head-quarters. The field and staff of the 88th [Pennsylvania] were interested spectators of this rout, as the combatants came yelling and tearing along the muddy road, the buttermilk hunters having a fine time cutting and slashing at the Union troopers, and letting themselves out on the rebel yell to the full capacity of their healthy kings. This humiliating scene thoroughly disgusted Adjutant [Edward L.] Gilligan, and directing Dr. Shoemaker and the rest of the staff to seek protection at brigade head-quarters, he determined to stop the stampede. Drawing his sword, he rode boldly down to the fleeing mob, calling upon the Union troopers to halt and rally, but his appeal had no effect upon them. The confusion was so great, and our cavalry were in such haste to get the aid of the infantry, that they passed the lieutenant, and before he realized the situation he was in the midst of the Confederates, nearly every one of whom cut and lunged at him in the most spiteful manner. Gilligan was dazed at this kind of reception, but by parrying the vicious thrusts he managed to save his skin, until an unkempt and unwashed grayback rode within a few feet of him and, presenting a navy revolver, ordered him to surrender. This the lieutenant did, but the Confederates were so intent on the fun they were having that they all chased off alter our horsemen, leaving the captive alone in the road. They had not proceeded far before they received the fire of the infantry; then the whole squad came tearing back, the Union troopers now in pursuit. Gilligan saw them coming, and hoping to save himself from being taken south, he slipped off his horse and lay flat in the mire in the road. When the Johnnies reached him they had no time to stop, and though they tried to sabre him as he lay in the mire, he escaped without a scratch, being, however, completely covered with mud. The boys had seen him captured, and when he rode into the lines again, encased with mud from head to foot, he was received with shouts of welcome and laughter at the unique appearance he presented. This was Gilligan’s first and last attempt to rally cavalrymen; he had enough and he knew it. To punish the pursuing squadrons a trap was laid for them, our infantry lying in ambush on the flanks, while the cavalry again allowed themselves to be chased along the road. The Confederate troopers took the bait, hook and all, and when the infantry rose and delivered a telling fire into their ranks at short range, what was left of them kept at a respectful distance during the remainder of the march, and the rear was not again molested. The division returned to camp on December 14 , many of the men with apple-jack in their canteens ; hence the name given the raid. Next post: NP: February 20, 1910 Richmond Times-Dispatch: Munford’s Troopers Last to Leave Richmond?